I admire chefs the way some people admire painters. Adepts at a mystery that gives pleasure to the senses, they transform the ordinary—our everyday act of nourishment—into poetry. It never surprises me to hear that they are sometimes painters as well, or novelists, or musicians. Or that painters, novelists or musicians might aspire to be chefs. What surprised me a bit more (and, indeed, it shouldn’t have) was the artistry of those who trade in the food and drink that is known for nuance and expert attentions. Italy has a long romance with its food and wine, and it’s both the ignited passion of first love and the peace and subtlety of a long marriage, which hasn’t lost its fire, though it minds the flicker of the light now, as well as the blaze and the heat. In short, they’re sophisticated in the palate, my current neighbors, as I discovered to my delight last week at Erbavoglio, on a little side street next to Aosta’s medieval Cattedrale de Santa Maria. They know us by our confusion, my countrymen. The deer-in-the-headlights look after the simplest of greetings says Indiana to the discerning Italian. 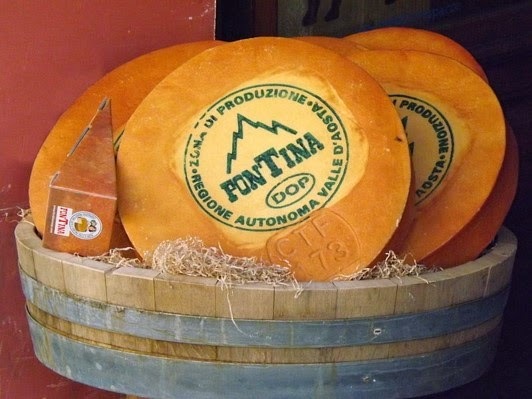 But Stefano was polite, and fairly fluent in English, and after a few minutes of small talk, less small and (to both of us) more interesting when the subject turned to his cheeses. It was “would you like some cheese?” to the second power. He was offering a glimpse of where cheeses come from, the heart of the heart of the aging. The downward steps could not have been more perfect: steep, narrow, and dust-encrusted. Stefano urged me to watch my head, and it was a good thing he did. Distracted by the sheer atmosphere of the place—both the smell and the whole Edgar Allen Poe gloom of the business (scary but only in a kind of moody way, not really frightening at all)—I stood a good risk of concussion, and ducked at the right time. Finding myself on a dusty floor, in a maze of shelves. Each cheese was given a wide berth: huge, encrusted drums that stank in that odd way of promising cheese, where you can’t imagine how something that foul-smelling could taste so good but it did, Stefano had sliced a small piece of fontina (the regional cheese of Aosta), so I knew that the fetid mask hid the musty amazements of the cheeses up in the shop. Beneath these crusts were the quartz-like shavings of parmesan, the soft gorgonzola with the verdigris of veins, the green that tasted somehow moldy and spectacular at the same time. It was impossible treasure, not a dozen feet below the surface of the town.